All of the pics that I have taken over the last five years or so and published in my photobucket ,were taken for the cost of the camera alone and that I got on sale ! The rest is just stuff that I had laying around the house.No expensive tripods,special lighting or other equipment is required.The modern day camera does it all for you,the only thing that you have to do is a simple setup.Put it on "Auto" and off you go ! You can experiment to your hearts content (no more film cost to worry about) If only one pic in fifty turns out so what ! Have fun. First the camera. I will take a pic of it in the mirror for your info.Point and shot,how simple can it be.Prior to the digital era I knew nothing about cameras and it is still that way today. All the technical stuff leaves me cold and I haven't even read the manual for the digital I am using now ! (some would say it shows LOL) If I can take reasonable pics anyone can do it. In my world all things are possible. Re: How to Photograph Your Models at little cost to you. I photograph models/dioramas also, so I can contribute a bit to this subject. One big plus I've found is using natural light whenever possible, that means taking it outside and using sunlight to cast realistic shadows. 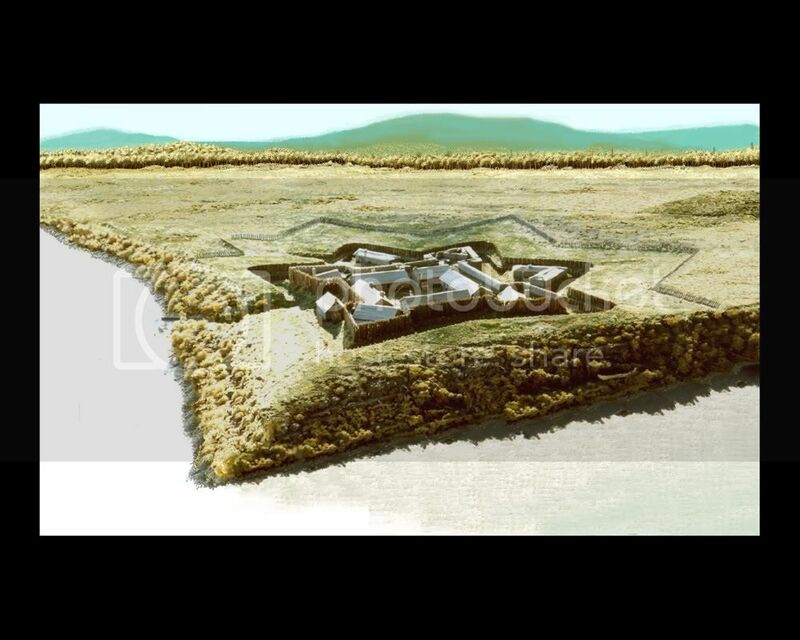 Below is a scratch built 1:112 scale model of Fort Duquesne a Vabaun Style fortification circa 1755 actual dimensions are 4'x4' image was Photoshoped to create background mountains and foreground water. Below is the image. This model can be viewed at the Canadian War Museum in Ottawa, Canada. In this image the actual model size is roughly delineated by the red lines, all the background mountains most of the clearing and some of the foreground water is all created in Photoshop. The camera body should be black so it doesn't get reflected by glass or other shiny surfaces. And that is about it camera wise ! Lighting. I use a hand held clip on with easily changeable ordinary household bulbs and experiment with different types, wattages and color.The key here is to try everything. I also use my white ceiling and one of those cheap car maintenance lights from the garage for bouncing light off the ceiling.On occasion when I want a nice moonlight scene I will use just an overhead florescent light.I have even used candles.Experiment and have fun ! And finally use your creativity there are really no wrong ways of doing things just new ways waiting to be discovered. Occasionally like John mentioned you can get some great results purely by accident. 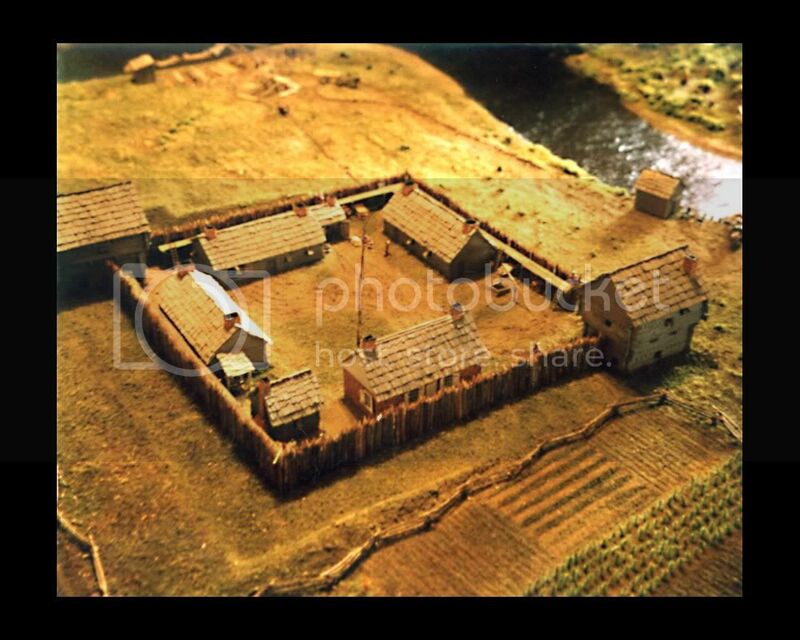 Below is an interior shot of a model of Ft. Sinclair circa 1765 that was located where present day St. Clair, Michigan is today. The model in this image was lit by overhead incandescent but the realistic water sun glare and shadows came from light from a nearby shop window. Cool cigar joe,love it ! Here is a pic I took and then fancied it up using photobucket. It is a pic of a 1/16th scale engine shop from the 1920's.It could be RR ,marine,auto or whatever.Everything here is scratchbuilt except the engine which was from a highly modified kit.Most of this is built with coffee stir stiks,tongue depressors,plywood or card.The lighting is from a dollhouse and the shades are modified brass Christmas bells.The clear glass is plexiglass savaged from an old parts container. This is a low angle shot as if your were backing up a truck to pick up a load,probably what you might see in a rear view mirror late on a summers evening.The lights reflected in the window glass adds depth to the scene.The doors act as a frame for the scene and also help to add depth as well. I took this pic with my old digital camera that didn't have a stabilizer,so all the lighting here is internal not hand held. One thing to mention at this point is that models that are/were intended to be used for film sets were usually constructed in 1/4 scale. As you can see from John's image much more detail is possible in these larger scales. For instance, on one of my 1:112 scale models a dot of paint suffices for a door knob while in a 1/16 or 1/4 scale model you can actually model the door knob in three dimensions. You are exactly right a lot depends on the scale.I like lots of detail that tell stories.I find that it is a lot easier to capture your viewers imagination this way.I admire anyone that can to it small ,I have tried but with little success. any tips? This shot was taken using my hand held light and hand held camera technique. I simply used my clip on light and shone it through the window to see what I could come up with.I am looking to set a mood with a little drama built in.Technically there are probably a thousand things wrong with the pic but I like it and I don't try to please anyone else. I am a great admirer of Sergio Leone the Italian movie director,who is my self appointed creative mentor and this is the way he operated too. In this pic I have used the open door at the rear and the shadows across the floor to create a more 3D effect. The foreground is out of focus for a reason, as it tends to put the figures in the limelight.The bar through the middle guys face was a compromise between his face (which was really not all that well painted) and the meds box over his shoulder.The box in my mind represents the great cost in injury and lives in the early days of aviation and I wanted it in.Sometimes with my hand held camera I am very restricted in movement when I am actually reaching into the diorama itself. What does this scene tell us ? We are inside an old building made of wood,the clothing styles are from early in the last century,the flag indicates it is air force military.The airplane is a biplane although it would work just a well with a car ,truck,boat whatever.It is probably early morning with the sun low on the horizon and the environment is a little dusty with even some smoke in the air. John you are also using a Leone styling technique by shooting a scene through an object in the foreground, in this case the biplane wing. You are exactly right a lot depends on the scale. I like lots of detail that tell stories.I find that it is a lot easier to capture your viewers imagination this way.I admire anyone that can to it small ,I have tried but with little success. any tips? I have two reasons for settling on the odd ball 1:112 scale the first is the availability of 15mm model figures in a wide range of military eras. My expertise is in military fortifications particularly for the Vauban (defense in depth) style prevalent during the Seven Years War (French & Indian War) & The American Revolution, up to the American Civil War. The availability of these figures, cannon, wagons, horses, etc., etc., for the models dictates the scale, the small scale works well for depicting the landscape and to the understanding of how the fortifications fit into the landscape and as to how they were designed to actually work. In this respect these fortification models are more closely related to to model railroads than to large scale dioramas such as John builds. The 15mm designation for size in military figurines is the eye height, measured from the base to the eye of the figure this equates to 15mm = 5.5 +/- scale feet. So if you have 25.4 mm to an inch, then 25.4 x 12 inches (1 foot) gives you 304.8 mm to the foot, divide that by 15mm will give you 20.32, multiply 20.32 by 5.5 scale feet gives you 111.76 scale feet to a foot, or round up to 1:112. There is also available a wide range of 12mm figurines which would equate to a 1:140 scale which I may take advantage of on my next project to be able to cover more territory. 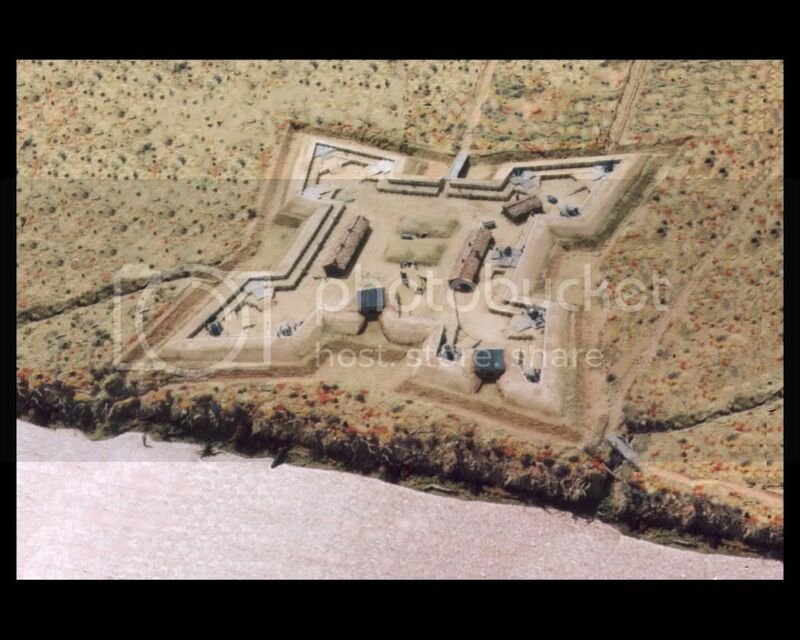 The image below is a Photoshoped "balloon's eye" view of Confederate Fort Hindman at Arkansas Post on the Arkansas River (Photoshop was used to extend the landscape out in all directions from the fort). It was an earthwork fort of 4 bastions and two large underground ammunition magazines (the two rectangular mounds in the forts center) built on the floodplain with two iron plated casemated naval cannon built into the earthwork to defend the Arkansas River from Union Ironclads. Again the scale is 1:112. and this model can be viewed at the Arkansas Post National Memorial. Here is the same group of figures under different lighting.The sun is bright and almost overhead maybe shining down through some windows high on the hangar doors.I used the same hand help camera and lights.The biplanes wings and struts help to frame the pic.By using the shadows on the floor it helps to enhance the 3D effect. The old sheet in the carpenters shop window has been pulled back to let some light in and also allows us to see the far wall for the same reason.The windows on the back wall open into a darkened storage area. The idea here is to get the viewer wondering about what they could be talking about.I have left a space in the grouping to allow the viewer's imagination access to the conversion.Here again the era is around the 1920's when smuggling booze across the border was a popular thing to do.In my mind the mobster is trying to convince the barnstormer to bring some stuff in for him while the corrupt official looks on.